In addition to the Paradise Inn there are several other notable historic buildings, mostly located a few miles down the road from the Paradise Inn at the small community called Longmire. The famous entryway to Mt Rainier National Park. This is the original 1916 park headquarters building, which is now a museum. Located at Longmire. There is a walking tour of the historic buildings at Longmire. You can get more information on the tour at the museum. The historic 1928 Mt Rainier NP Headquarters Building. A new headquarters building is now located outside the park, however the old headquarters building still houses various park service offices on both floors. Check out the size of the rounded glacial boulders set into the 1st floor walls. The second floor is made to look like a log building, but it is actually siding cut from logs placed over standard milled lumber framing. There are plenty of real full logs in the building, note the roof and porch beams as well as the 3 huge logs at each corner of the building. Inside is a reception area with a rock fireplace, a conference room, and lots of offices. There is a jail cell in the basement! 1916 The National Park Inn (Annex) although this is the best known view of the Inn, it is the back of the Inn. The main entrance and parking are on the opposite side. The original National Park Inn was built at Longmire in 1906 by the Tacoma and Eastern Railroad. This building you see today was originally the Longmire Springs Hotel, built in 1916, across the road from where it is now. 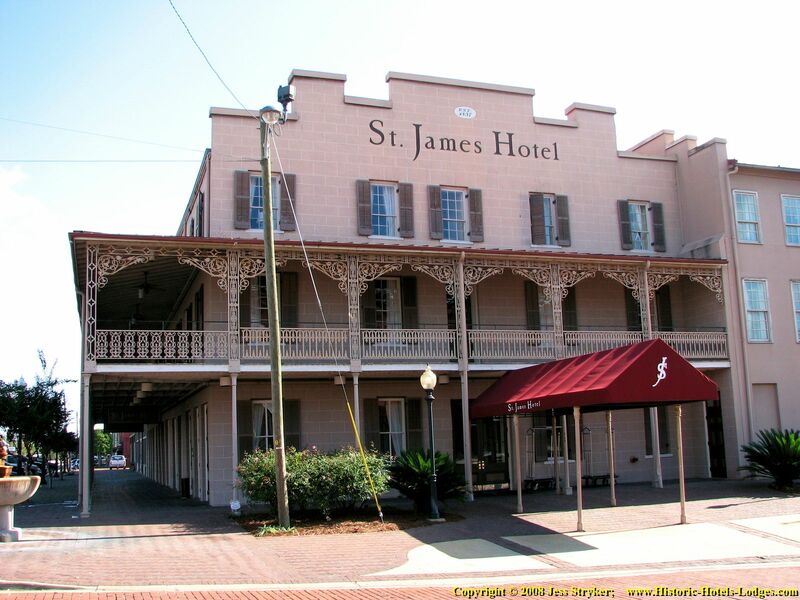 It was moved to the current location in 1920, where it sat adjacent to the original National Park Inn which was built in 1906. It was called "The National Park Inn Annex" and provided 17 additional small guest rooms for the Inn. The original National Park Inn burned to the ground in 1926 and was not rebuilt. The former "Annex" building became the National Park Inn and is the building pictured here. The National Park Inn still operates as a Inn and Restaurant. 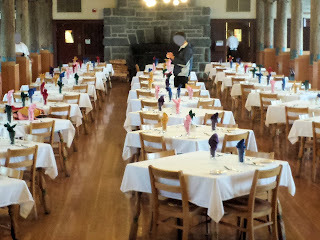 We had an excellent lunch at the Inn's small dining room. 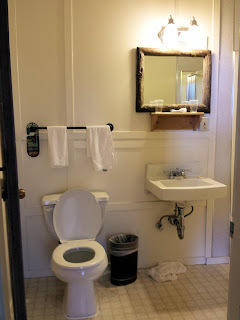 Guest rooms are similar to the Paradise Inn. National Park Inn, sitting porch. National Park Inn Original Back Entrance, now updated to be the Main Entrance from the parking lots, which are behind the hotel. The restored 1929 Longmire Service Station (no longer in service.) It has a small apartment under the gable roof on the second floor. 1911 Hiker's Center, now the Longmire General Store. 1923 Longmire Wood Suspension Bridge over the Nisqually River. Oldest surviving bridge in Mt Rainier NP. The Community Building is about a quarter mile away from the other buildings in Longmire, to reach it take Longmire Road across the wood suspension bridge and continue on the road about 1/4 mile. If the Community Building is not open, look in the windows to see the impressive, and nearly original, community room with it's exposed log roof trusses and rock fireplace. Reconstructed 1888 Longmire Cabin at Longmire, WA. The Longmire area has natural hot springs (which still exist and are still hot) which attracted visitors to the area. James Longmire claimed the area and built a small resort here, none of which remains. This cabin was built by his son, Eclaine, in 1888. The cabin and remains of the hot springs facilities are located on the Trail of the Shadows, directly across the highway from Longmire. The cabin is somewhat furnished inside. Be sure to check out the door hinges. Longmire Hot Springs. These are some remaining walls from the former hot springs development. Most of the improvements made as part of the hot springs resort have been removed. Development of the hot springs as a tourist destination began around 1883 and eventually included a couple of small hotels and a scattering of cabins, as well as tubs and other facilities for enjoying the hot springs. 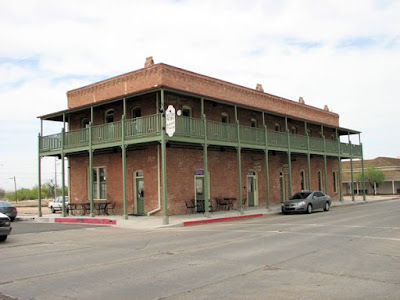 In addition to the Paradise Inn there are several other historic buildings in Paradise Valley, together they make up the Paradise Historic District. For much more detail on the history and some historic photos of all the buildings mentioned here, see the references at the bottom of this page. The following is a very brief overview of the architectural history of Paradise Valley. The earliest formal lodging at Paradise was a huge group of white tent cabins called "Camp of the Clouds" (AKA "Reeses Camp") that sat on "Theosophy Ridge", (a name that no longer appears on maps). This is the ridge just behind the new Jackson Visitor Center. As best I can tell from old photos the camp was in the general area of where the Alta Vista Trail crosses the Waterfall Trail. There were less trees on this hillside back then. It began operating in the late 1898. It wasn't the first services in the Valley, but was the first major one. Camp of the Clouds was removed in 1930. Camp of the Clouds, photo by John Reese. This photo was taken from the approximate location of the new stone "Muir Steps", between the Jackson Visitor Center and the Guide Services Building. The gentle hillside in the foreground has now regrown. 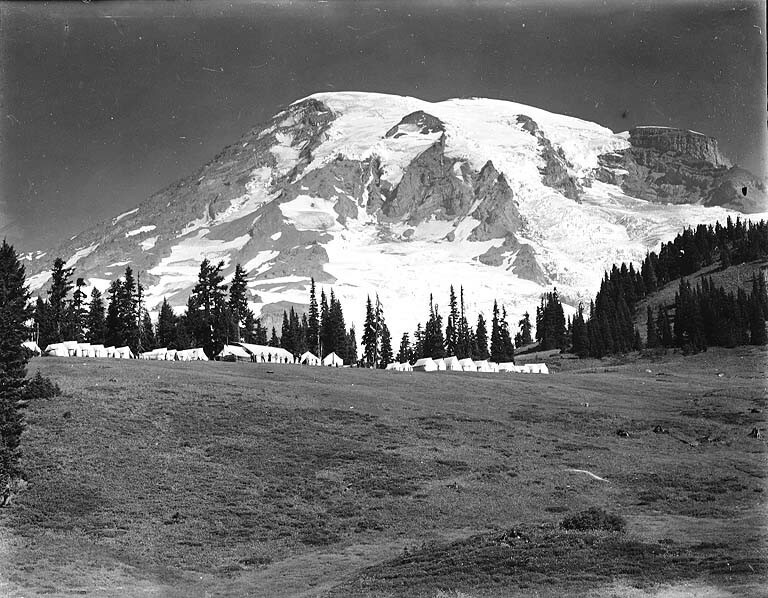 In 1916 the Rainier National Park Company (RNPC) was formed and took over all concessions in the park. The RNPC immediately built the Paradise Inn which opened in 1917. A set of temporary tent cabins were built behind the Paradise Inn, where the Annex now stands. A more detailed history of the Paradise Inn is on page 1 of this article. Two dormitories were built at the same time as Paradise Inn, named Sluiskin Club (for male employees) and Tatoosh Club (for female employees.) 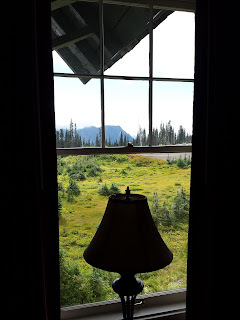 Sluiskin was the name of the guide that lead the first recorded climb up Mt Rainier in 1870.) These dorms were aligned with the Inn and located just up valley from it (on the kitchen end of the Inn.) Tatoosh was about 50 feet away (just beyond the current loading area pavement), and Sluiskin about the same distance further from Tatoosh. The locations are still apparent today as level areas where there are still gaps in the big trees. They were very simple buildings, box shaped, with steep roofs and no adornments. From photos it appears Tatoosh was 3 floors and Sluiskin was 2 floors. Both have been demolished, likely in the 1930's or 40's. The only historic photos I've been able to find online of these buildings is embedded in Paradise Camp, Archaeology in the Paradise Developed Area. See the references. The Paradise Camp was a large tent cabin community that was located on the south end of where the current visitor center parking lot is now, extending south under the area now covered by the road. The Paradise Camp building was a 3 floor building that provided the front desk, a store, and a restaurant for the tent camp. Architecturally it was similar to the Guide Services Building, the main wing also having a gambrel roof. Paradise Camp was intended as a less expensive alternative to the Paradise Inn. In the 1920's the Paradise Camp building was expanded to enlarge the restaurant and kitchen and add about 20 guest rooms, which was renamed the "Paradise Camp Lodge". Sometime over the next 10 years the Paradise Camp tent cabins were phased out and removed, leaving just the Paradise Camp Lodge in this area. A warehouse building was constructed behind the Paradise Camp Lodge in 1930 about where Paradise Road runs now. Sometime after 1940 the Tatoosh Club dorm building was demolished and it appears someone took the "Tatoosh Club" sign from it and nailed it up on the Paradise Camp Lodge. Whatever the real reason, the Paradise Camp Lodge somehow took on the "Tatoosh Club" name. In a few cases it is also called the "Winter Lodge", likely because it was open year-round. Through the '40s and '50's the building seems to be referenced by all 3 names in different articles: Paradise Camp Lodge, Tatoosh Club and Winter Lodge, all being used interchangeably. By the 1950's the Paradise Camp Lodge building was being used as an employee dorm. Sometime in the mid 1950's as the Park Service embarked on it's Mission-66 modernization plan. The death bell tolled for Paradise Camp Lodge. A new employee dorm was built down the highway at the lower day-use/Nisqually Vista Trail parking lot. The Paradise Camp Lodge was demolished, along with the old Sluiskin Club Dorm. The warehouse and some outbuildings also were razzed during the early '60's. The main road was realigned and the site where Paradise Camp had stood became a parking lot. Yes, "they paved Paradise and put up a parking lot!" (Note, the foundations of the Paradise Camp Lodge still exist under the parking lot. Portions were excavated and documented in detail by archaeologists when the Jackson Visitor Center was constructed.) For a good color picture of Paradise Camp Lodge see Paradise Camp, Archaeology in the Paradise Developed Area. The 1920 Guide Service Building at Paradise Valley, about a block away from the Paradise Inn. The Guide Service Building, originally home for the guides who lead climbing parties up Mt Rainier. This historic building now serves as housing for the employees at the Paradise Inn which is a short hike away. It is different in appearance from every other building in the park due to the gambrel roof (def: a roof that is divided into two slopes, one steeper than the other.) There is a small auditorium in the basement, the ground floor is offices, the upper floors are all dorm rooms. Adjacent to the Guide Services Building is a historic 1922 ranger station and 1928 restroom building that for some reason I did not photograph. Both still exist and are in use for their original purposes. In 1930 a third hotel went up called "Paradise Lodge" (don't confuse with Paradise Camp Lodge, which is a different building.) It was located about a quarter mile west of the Paradise Inn in the area where the Nisqually Vista Trail parking area is now. A small city of 275 new all wood cabins were built adjacent to the Paradise Lodge to serve as replacement lodging for Camp of the Clouds which was removed. The Lodge had a community center and support services for the surrounding cabins. The cabins were removed during WWII and moved to Seattle to be used as housing. The Paradise Lodge building was intentionally burned down in 1965 to make way for another day-use parking lot. In 1938 a rope tow was installed on Alta Vista hill and down-hill skiing was introduced. A related power house built in 1937 for the tow rope still remains. It's a small, but tall, building with a steep gable roof and a stairway leading to a door high above the ground level to allow easy access when the snow level was high. The Power House is located right next to the Guide Service Building, on the up-hill side. Wonderland: An Administrative History of Mount Rainier National Park. By Theodore Catton. May 1996. Longmire Buildings. Architecture in the Parks. By Laura Soulliere Harrison. National Park Service, Department of the Interior. Nov. 1986. Longmire Administration Building, Community House, and Service Station. Architecture in the Parks. By Laura Soulliere Harrison. National Park Service, Department of the Interior. Nov. 1986. Paradise Inn. Architecture in the Parks. By Laura Soulliere Harrison. National Park Service, Department of the Interior. Nov. 1986. Paradise Camp, Archaeology in the Paradise Developed Area, Mount Rainier National Park. by: Greg Burtchard, Benjamin Diaz, & Kendra Carlisle. Contributions by: Jacqueline Cheung & Eric Gleason. February 2008. 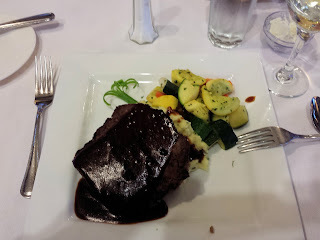 The food looked and tasted great! Note: The guest rooms have been remodeled since our visit. This is how they looked in September of 2016. The room configurations are not expected to change with the remodel however room & bath fixtures, finishes and fabrics will likely change. 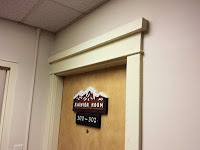 We stayed in a Suite with Sitting Room, The Rainier Room. 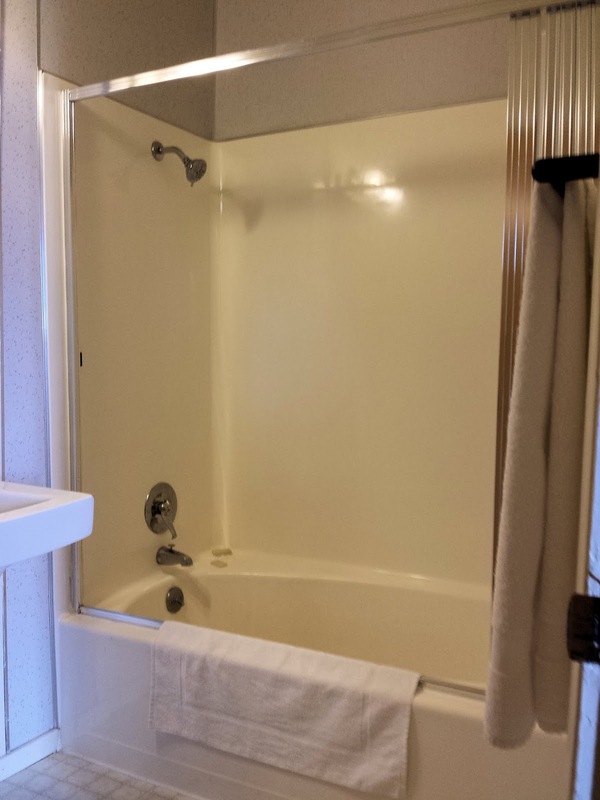 On the Inn's booking page I see it is currently called "1 bedroom suite bath", but assuming the remodel doesn't change it, this is a true 2 room suite with doors on each room. A private hall links the 2 rooms with a private bathroom. These suites are corner units so most of them have more windows (but not on the top floor where the sloping roof interferes with windows, so request floor 1-3 if you want lots of light and windows like you see in the room here.) These suites are definitely a step up from the standard rooms a lot more space. I believe they are the only rooms with queen beds as well. The Rainier Room is one of the nicest suites due to it's location on the South-West corner of the building. These suites are hard to reserve, they tend to sell out early. We were able to book one because we visited in late fall when there are fewer guests. But the downside of that is that it was foggy and raining much of the time we were there. The suite's sitting room with a futon. The suite's separate bedroom with a queen size bed. 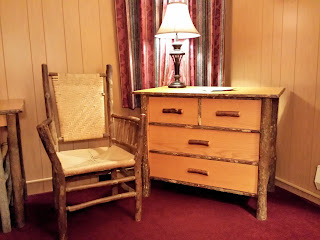 Rustic furniture in the room. There was a view of Mt Rainier from both rooms. The private bathroom was utilitarian, nothing fancy. However National Park lodgings often upgrade the baths during remodels, so they may be different now. Bath's are one area where the park service does not always require remodels to be historically accurate. Here are closer looks at some of the architectural details at Paradise Inn. Notice how all the beams are rounded log shapes. Very little milled lumber that is visible other than the trim and window/door frames. 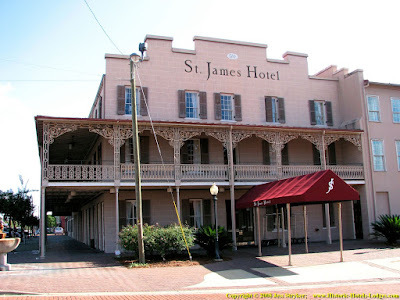 This is unusual, on many of these historic rustic hotels only the larger major beams are logs the smaller ones are standard cut lumber which is easier to work with and saves money. Roof support details. Outlookers (the logs protruding from the building that support the exposed rafters and braces that support the outlookers. This is classic rustic architectural detailing. You can also see the cedar shingle siding as well as the cut stone chimney in this photo. A gable dormer on the main building, again notice all major beams are rounded logs. Original gabled dormers on left, later replacement shed dormers on right. Rustic field-stone on a corner of the Annex Building. A closer look at one of the parchment lamp shades. Each features a local native plant. Painted top of a column or post in the Great Room. Painted bottom of a column or post in the Great Room. 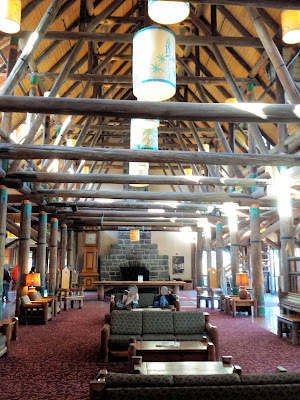 The Great Room (lobby) of the Paradise Inn features vaulted ceilings with open beam log rafters. 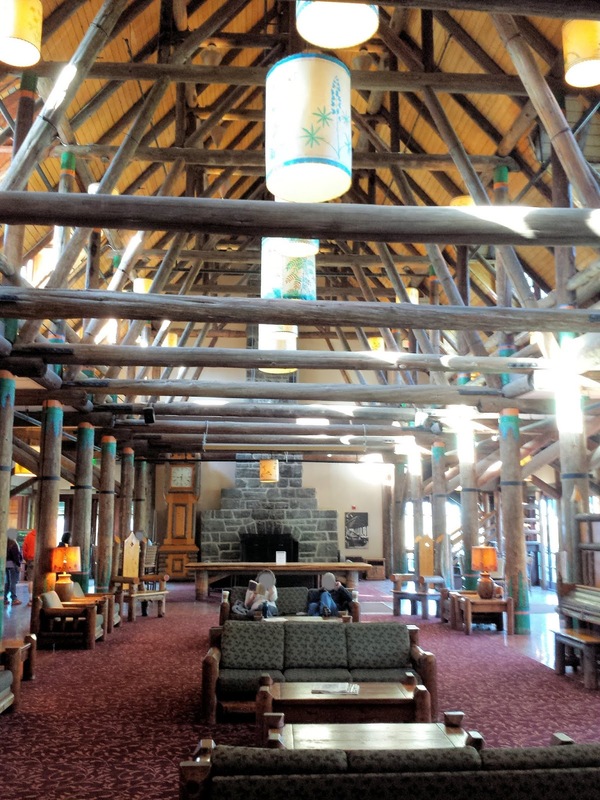 The intricate exposed Alaska Cedar* log rafters are the main architectural feature of the Great Room. Additional beams, rafters, cables, and metal bracing plates were added to the Inn's interior over the years when it was discovered that the snow loads were greater than anticipated and causing damage. A large rock fireplace is found at each end of the Great Room. On the back side of the Great Room (left side of this photo) what used to be a porch has been enclosed and is now a cafe and gift shop. Neither addition is historic, however some of the original patio doors still remain between the gift shop and the Great Room, serving as a divider wall. A few pieces of large hand-crafted furniture made from logs in a German Gothic style are featured in the great room. Julie is seated in a oversize "throne" chair at a massive wood table. The artistic "log" furniture at the Inn is said to have been crafted by German furniture maker "Hans Fraehnke". Little is known about him that I can find. Most of the other furniture in the Great Room and dining Room are historic, but were factory manufactured items. Log Piano in the Great Room. Grandfather clock in a rustic log cabinet. A mezzanine was added in 1925 and circles the Great Room. Tables line the perimeter of the mezzanine. Julie standing on the mezzanine. 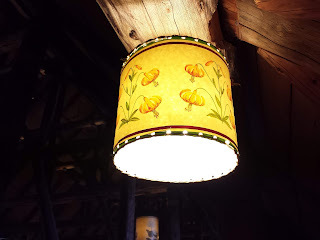 The original lamps in the Great Room were Japanese lanterns. In the early years they were replaced with parchment lamp shades. Each shade features a local native plant hand-painted on it. Julie seated at one of the mezzanine level tables. Generally the mezzanine level is more quiet than the Great Room seating below. A nice place to enjoy hot chocolate on cold mountain evenings. Mezzanine stairs with log newel posts and rails. The dormer windows above the Great Room allow sunlight to enter. These are photos of historic Paradise Inn at Mt. Rainier National Park in the State of Washington, USA. 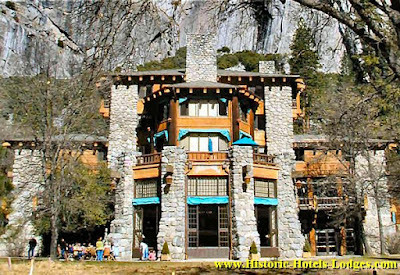 The Paradise Inn is a classic example of National Park Rustic Architecture, with giant fireplaces, and huge exposed log beams. These photos were taken September 5-8, 2016. I've added a brief history of the Inn as well as detailed descriptions. As always I will point out things not noticed by most visitors and discuss the architecture a little.